Abe's Hidden Treasures is located in the historic downtown district of New Carlisle, Ohio in the old New Carlisle National Bank building located on the corner of St. Rt. 235 & 571 know for being the site of the fisrst robbery of the infamous John Dillinger. 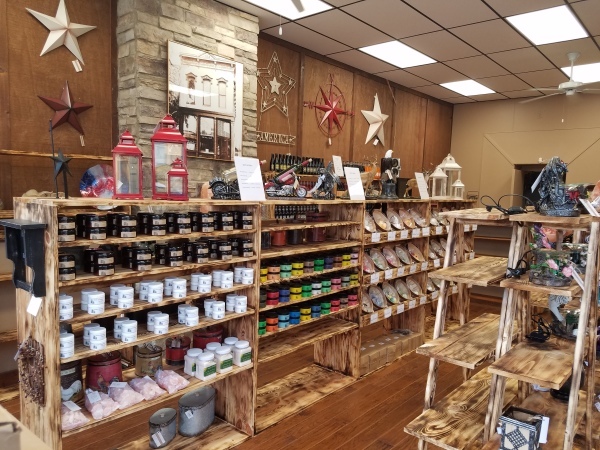 We offer a wide selection of merchandise ranging from furniture to home decor, candles to antiques, glassware to electric warmers, old fashion sodas and more. Stop in to shop around for all those special holidays or occasions and find the truly unique item that put a smile on anyones face. Don't need that, how about picking up a electric warmer and scented oil or wax melt for yourself that will make your home or office smell great. And don't forget about the car, those car air freshners will make your friends jealous when your giving them a ride to the office. Stop in to the best place around to pick up those last minute gifts or plan ahead and shop early for those of you that like to plan ahead. Not sure what to buy, stop in and ask for a gift certificate. we can hook you up for any amount you need.